Great Location for Large Family Vacations, Anniversaries & Reunions. For full information please "Google' ----- " kossow lodge". Please be advised that we desire two way phone conversation with all prospective tenants. Please contact the owners Deke & Nancy Eaton at 781 444-3146. So if you send an inquiry, please, include your phone contact numbers Further we have what we call a MPR= Minimum Pro Rate of $ 4290, which comes from our 5 night minimum stay at $858 per night. During the peak months of summer we go from Saturday to Saturday (one week).at $9,500 per week. During the off-season we have our minimum stay of 5 nights., which costs $4290 and a full week costs $6,000. Call us directly at 781 444-3146 for full details. 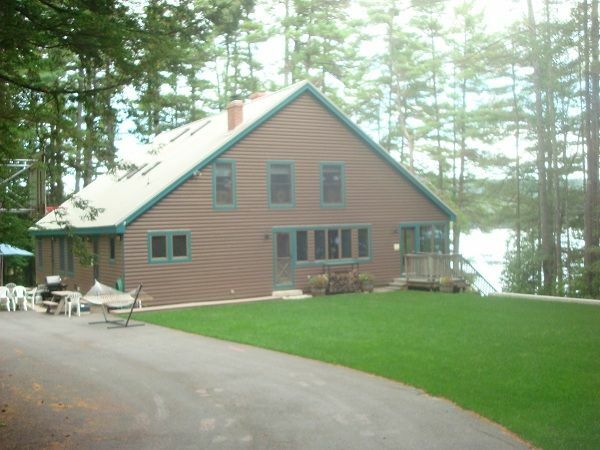 Welcome to Kossow Lodge, our home, a 4-season, private Lodge on beautiful Crescent Lake, in the Town of Raymond Maine. Crescent Lake is in the heart of the Sebago Lakes Region of Southwestern Maine. The perfect all season place to hold large or multi-family vacations, college reunions, business retreats, anniversary gatherings, fishing trips, Thanksgiving and winter holidays, and skiing and snowmobiling trips. With eight bedrooms and five bathrooms, the lodge comfortably accommodates twenty five people. It provides both seclusion and serenity, as well as plenty of activities for family and children. With 2.8 acres on 283 feet of private waterfront, on the western shore of Crescent Lake, Kossow Lodge offers something for everyone to enjoy during their stay. A 17-foot canoe, Sunfish and two Kayaks are included in the rental. A 14'/10 HP boat is available to rent. Recent addition is the fully automatic standby generator to power the Lodge. Due to past problems we longer rent to weddings or receptions. Pack your bags, Not your home, come and enjoy. : The china cabinet has service for 20+ people and the large dining room with its own stone fireplace can seat your whole multi-family group. The adjacent porch has its own large picnic table. In summer, the porch (60' x 12') with its full length Anderson Casements with screen & glass allow you to enjoy the beautiful lake views. The porch is the ideal gathering spot to relax and enjoy the beautiful lake views. Venture outside to enjoy the open deck patio with its own comfortable chairs & tables, 2 chaise lounges, picnic table and a hammock. Travel down the steps to our dock, which has space for your 20+foot boat plus mooring floats. Swim to the float and enjoy the sunshine. Take the kids water-skiing. Or simply keep your eyes and ears open for the loons and recently bald eagles. Kossow Lodge provides plenty of outdoor activities for all ages including badminton, croquet, and basketball. The indoor gazebo offers a quiet spot for cards and board games. Ski trips are a breeze with Shawnee Peak only 25 miles away and Sunday River just 53 miles away. In addition to the supply of regular towels for everyone we also supply large size beach towels. Electrical Generator for back up power when Maine Central Power goes on vacation. It starts up automatically and you are never without electricity. The Lodge is next to a brook and walking trails offer daily exercise. Crescent Lake lies in the Towns of Raymond and Casco, Maine. It is 4 miles long and 2/3 mile wide at its widest point. The maximum depth is 54 feet and fishing is good year round. Crescent Lake is a good size for moderate boating and is relatively quiet. Crescent Lake connects to Panther pond which then feeds into Sebago Lake. The Tenny River links Crescent Lake and Panther and is navigable. Contact the owners at 781 444-3146. Recently installed is a Siemens 16 KW Electrical Generator for back up power when Maine Central Power goes on vacation. It starts up automatically and you are never without electricity. After years of vacationing on the Cape, we decided to try something more secluded, serene and laid back. Crescent Lake in Raymond, Maine has provided our family with many enjoyable summer months away from the madding crowd. We do not accept or use credit cards. After initial inquiry we prefer personal phone contact with our prospective tenants. Google ....kossow lodge to view our web site with 50 plus photos. toilet, This is a half bath with toilet and sink basin. Five bathrooms total, 3 Full and 2 Half Bathrooms. The three Bed rooms on the first floor are supplied with 2 Robes each. We Supply a Canoe, Sunfish and two Kayaks. Our Dock and Swim Float plus two mooring bouys for you Fleet. (4) 5 Phones are located throughout the Lodge. Some cell phones work well others do not. Service is improving all the time. We have switched to Verizon, Verizon works well. Lodge is heated and well insulated. In addition large beach towels are provided (One for each person) Let us know in advance the # guest so that we might arrange bedding for Aero Beds and Pack & Plays. washer & dryer are located in the kitchen area. (3) Total of 3 refrigerators. Two in the kitchen and 1 in the basement playroom. Several coffee makers are provided. Lodge kitchen is fully equipped. A total of 3 Refrigerators. Two in kitchen and one in basement playroom. U will want for nothing. (2) Two large screen TV. One in the Great Room & one in basement playroom. Take -a-book and leave-a-book is our policy. 14 ft boat with 10 HP motor avail at very favorable rate. 60' Trek patio overlooking the lake with picnic table, deck tables, chairs, hammock. Ideal lodge with spectacular views for family vacation and family reunion! My family stayed at Kossow Lodge for a long family reunion weekend. We were a group of 22. We could not have asked for a better experience. From the incredibly attentive owners to the fully (and I mean fully!) stocked house, everything was better than advertised. Even the weather in Maine in April cooperated. I would highly recommend to anyone seeking a great location where multiple families can stay together and enjoy one another's company while still having plenty of room and activities for everyone. The amenities were fantastic - we used the grill, the firepit, the sand box, basketball hoop and multiple seating areas. We look forward to coming back and using the dock and boats in the summer. We have stayed at many VRBO spots and this by far has been the best. Well done Eatons! We thank you for your kind review. We are not only happy that you enjoyed all the items we offer but that you left the property in such great condition. You are welcome back any time!! Fantastic place, just as advertised. We've rented a lot of places over the years, and Nancy and Deke could not have been nicer or easier to deal with, and are really pros at renting out the lodge. The site on the lake is beautiful -- great for swimming, boating, and fishing -- and the house and grounds big enough for large groups. We had extended family of 17 there, with 8 kids, aged 3-11, and it was our most fun/successful group vacation ever. There's room enough to stay out of one another's hair, let the kids play, and all eat dinner together (inside or outside). We caught fish, hiked the nearby Bri-Mar trail, napped, ate well, some played golf, etc. All had a great time, and all would do it again. We have done several home rentals over the years, even though some were a little fancier this one seemed to have everything we could want. The setting was perfect and peaceful (except for the one night when there was a party next door). Which we understand only happens once a season. Everyone enjoyed having the boat and kayaks. We have never had so many items provided for us, whenever we looked for an item in the kitchen it was there. It was so nice to have someone to meet us and show where everything was. Everyone said they wouldn't mind going back again, and hopfully we wil. Thank you for the fine review and we look forward to seeing you in the future. Overall, this place is great. However, I believe that the sofa beds in the basement should be tossed! We were the unfortunates in our group that slept on them and it was awful! We came all the way from Georgia and never really slept. I never write negative reviews but, I felt it absolutely necessary so I could save some poor souls back! The bathroom situation is also better for 16-20. On a positive note, everyone else seemed very comfortable and the place is beautiful!! Thank you for giving our vacation home five stars and an overall rating of excellent. We are sorry you did not get a good night’s sleep on your vacation. We will review the quality of the sofa beds for future users. If you return in the future, please notify us of any problems during your stay as we take pride in providing a vacation place that is comfortable for all. We were a family group of 19 with ages of children from 2 to 22. There were activities available for all age groups. Everyone reported having a wonderful time. The bedroom arrangement worked well for our family. We especially enjoyed the outdoor fire pit for s'mores in the evenings; the lobster steamer was superb for cooking lobster dinners; the children loved swimming in the lake, playing ping pong, air hockey, kayaking, and shooting basketballs. The indoor playhouse and outdoor sandbox was enjoyed by the younger children. The owners were wonderfully accommodating and pleasant to work with! Nancy & I thank you for the very nice review, Look forward to your return in the future. Best Reunion Week Ever!!!!! Great House for Very Large Group!! The Kossow Lodge is a great place for a family reunion or get together. My family(8 brothers and sisters) have not been ALL together for over 15 years, as we are spread out all over the country. I wanted to have a special family reunion for my mother's 80th birthday and we could not have had a more perfect week than at Kossow Lodge. I started planning the week last summer with the help of Nancy Eaton. She was extremely willing to answer any and all questions I had regarding the facility. The lodge far out-weighed our expectations. We had a very large group, over the suggested 22, and we were very comfortable in our accomadations, There were 4 pull-out sofas in the enormous basement for the older children, who liked to stay up late and play games and watch TV! It was a great place for them, because you could not hear a peep upstairs! We had all ages ranging from 8-80, and there was something for everyone, I have a very active family and there were quite a few trails to run and exercise very close by. The lake itself if absolutely beautiful and peaceful. The kayaks, canoe, sunfish and motorboat were a hit with our entire group. The lake temperature was surprisingly warm and the lake itself was not crowded with other boaters at all. We felt like we were the only ones on the lake most of the week. We have had some large family gatherings in the past and have never had a kitchen stocked with so many amenities to accomadate our large number of people. There was also SO much room to actually sit and eat as a family, I have also never rented a house with so much seating for meals. The screened porch was used at night for family reminiscing, and we all fit very comfortably. If you were quiet enough, you could hear the loons every night. We left a few items behind on check-out day, and Nancy graciously sent the items immediately. I had the opportunity to meet both Nancy and Deke Eaton on check-in day and check-out day and there couldn't be two nicer people, who have thought of everything to make the Kossow Lodge an experience you won't soon forget. There are so many activites and sights nearby, I could have spent a month there and not done them all! My 8o-year old mom said it best - "it was the perfect week" I would highly recommend the Kossow Lodge to anyone who wants a week on a lake to remember! It is so nice to receive this wonderful positve review. Robin covered so many highlights in her response, we cannot add anything more to this review. Robin and her family are welcolmed back anytime. Nancy and Deke, look forward to having this fine family return. Other Activities: Basketball, badminton, croquet, full size pool table, ping-pong, air hockey & foosball. Rent a Pontoon boat and moor it at the Lodge dock. Rent a water ski boat, several marinas will deliver and pick up. Golf: POLAND SPRINGS------Poland Spring was the first golf course built at a resort in America and includes views of the White Mountains; fast bent wood greens, beautiful fairways, ponds and tees for all abilities. In 1896 Arthur Fenn designed the first 6 holes, and 1912 Donald Ross added his signature to complete the full 18 holes. He created a championship course that is maintained today. It is the treasure of Poland Spring. Ski: 'Kossow Lodge' is perfect for the large family groups that downhill ski or cross country ski. Shawnee Peak is close by and Sunday River is 53 Miles away in Bethel. For those that want to sled or ice fish or snow mobile 'Kossow Lodge' is the place to stay. Shawnee Peak is close by at 23 Miles. Maine State Lodging Tax is 9%. When the $500 reservation check arrives , Nancy emails an acknowledgment & sends the rental agreement. DURING PEAK SEASON WE ONLY RENT BY THE FULL WEEK--- (middle of June till early September) . Arrival time is Saturday Noon---DEPART following Saturday at 10 AM OFF SEASON FULL WEEK is $ 6000 OFF SEASON : MINIMUM PRO RATE IS $4290 for 5 nights, @ $858 per night. We require a $ 500 dollar reservation deposit, followed by 50% of remainder 60 days before arrival, and last 50% 14 days before arrival plus state tax.